Just some of the money the government paid out in calendar year 2015 because the DOJ’s insistence on defending bad agency FOIA positions in court. The US government paid out $1,904,591.60 in attorney fees and costs after defending –and losing— bad agency FOIA positions in 2015. These payments include: shelling out $30,000 to the Georgia Latino Alliance for Human Rights in their FOIA battle against the Department of Homeland Security over records on “Georgia’s increasing involvement in immigration enforcement, including information that will shed light on increasing reports of racial profiling and police abuse;” $140,000 to the Center on Race Poverty & The Environment in their case against the Environmental Protection Agency for records on several EPA Office of Civil Rights investigations; and $414,478.40 in Hall vs the CIA, a case concerning POW/MIA records. These figures are found in the Department of Justice’s Office of Information Policy 2015 FOIA litigation and compliance report, which details OIP’s efforts to “encourage” FOIA compliance throughout the 2015 calendar year. It’s worth noting that the amount of money paid after losing FOIA cases only represents a small fraction of FOIA litigation-related costs; for example, in FY 2015 the government incurred $31,300,000 in litigation-related costs – and only recouped $4.4 million in FOIA fees, begging the question of the necessity of fees in the first place (more on that from Nate Jones here). This incredible waste of taxpayer funding –which simultaneously upholds dubious government secrecy– underlines perhaps the key failure of the Obama administration’s FOIA policy: it’s inability to compel its Department of Justice to follow it’s own “presumption of openness” guidance, rather than defend every agency withholding at seemingly every instance. The OIP report also discusses new guidance on the use of “still interested” letters — letters agencies send FOIA requesters – often years after the request was made – to determine if the requester is still interested in the request being processed. While OIP guidance requires agencies to limit the instances in which they send such letters to when the agency “has a reasonable basis to believe that the requester’s interest in the records may have changed” and instructs agencies to provide requesters a reasonable amount of time to respond to the query (30 days at a minimum) – the overall premise behind these letters remains fundamentally flawed. There is nothing in the FOIA itself that allows an agency to close a request if the agency does not receive a response from a “still interested” letter, and any guidance that condones an agency closing a FOIA request without legal authority provided by the FOIA is misguided and should be revised. A must-read report from OpenTheGovernment.org (OTG), however, shows that this is not the case. Fortunately, Congress has taken a more proactive approach than the Department of Justice. 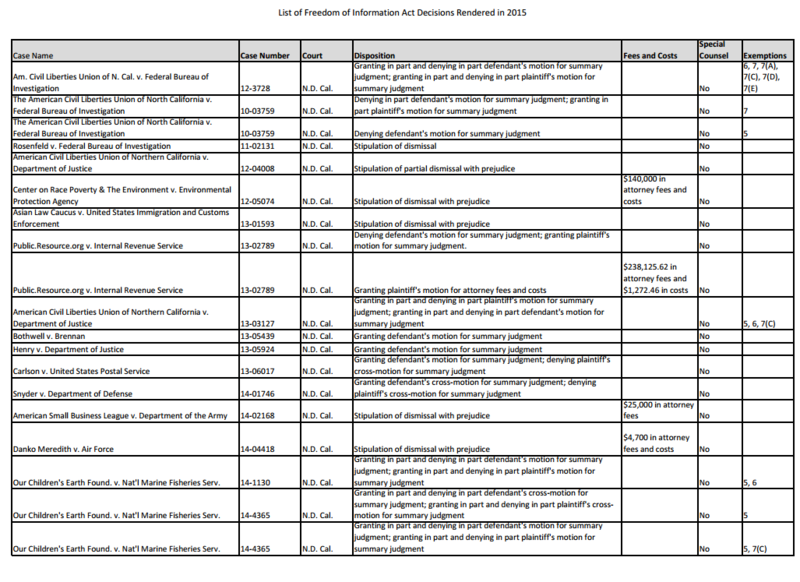 FOIA reform bills that have unanimously passed in both the Senate and House (but distressingly have not yet become law) each require agencies to update their FOIA regulations within 180 days after the passage of the bills. 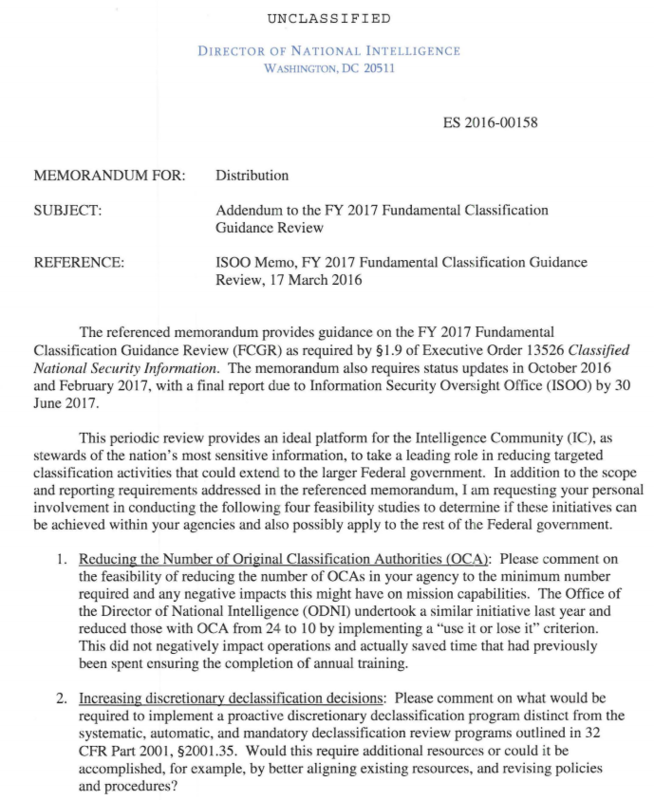 One of the ways agencies in the IC –and across the government– can improve their proactive discretionary disclosures is by formally adopting Clapper’s and DNI General Counsel Bob Litt’s instruction to declassify historic documents even when they may be technically “properly classified.” Two Sunshine Weeks ago, Litt stated that those with classification and declassification authority must ask themselves “not can we classify, but should we?” Pointing to Section 3.1 (d) of the Executive Order on Classification 13526 — the “Public Interest Test” that allows agencies to declassify documents even if they are technically “properly classified” — Litt claimed that declassifiers of historic documents should already be using this authority. In practice, however, they are not. What can the US National Archives (NARA) do for truly open government? The National Security Archive’s Nate Jones argues that declassification needs to be the focus of NARA’s upcoming Open Government Plan, and suggest speeding up and expanding declassification at the National Declassification Center, celebrating the upcoming release of the remaining JFK assassination records, and declaring the Senate’s report on the CIA’s torture program a federal record as just some of the ways for NARA to establish itself as the federal government’s principled leader on declassification. Get the in-depth recommendations here. Key Targets for SAC Forces. 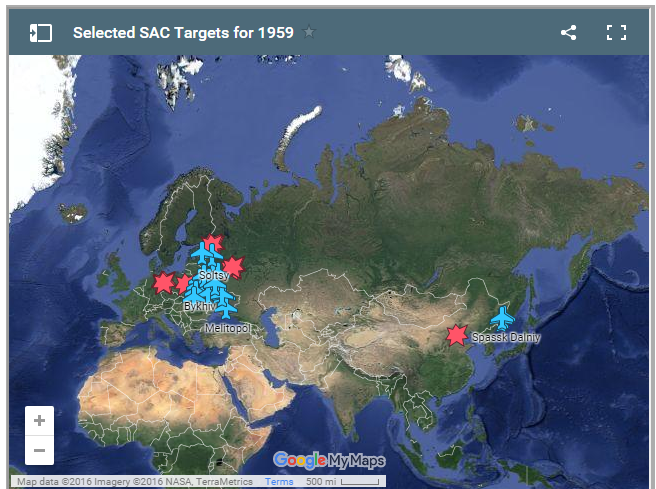 Which cities were the most heavily-targeted in Strategic Air Command’s ‎nuclear weapons requirements study for 1959? The National Security Archive has posted the full 306-page list after a number of interested readers wrote to find out whether their city or locality is on the massive list of urban-industrial complexes that was part of the SAC study, initially posted by the Archive in December 2015. The full list show shows Berlin, Bucharest, Budapest, Dresden, Leipzig, Riga, Sofia, Tallinn, Tbilisi, Vilnius, Warsaw, and Wrocław (Breslau) were among the most heavily-targeted. 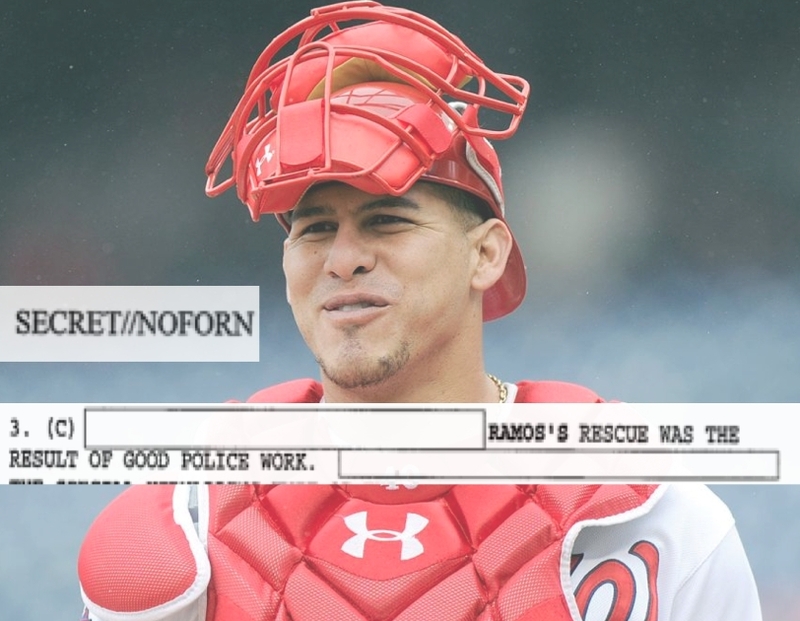 A fascinating read to tide baseball fans just in time for opening day: The Wilson Ramos Kidnapping Declassified. A State Department cable released in part thanks to a National Security Archive FOIA request sheds light on the scary 2011 incident, lauds Venezuelan police forces for his rescue, and raises more questions on the possibly motivation for the Washington Nationals catcher’s kidnapping. The Archive is appealing the redactions to learn more. This week’s #tbt pick is a 2013 posting from the Archive’s Nuclear Vault on the Israel-Argentina Yellowcake connection; the posting includes previously secret documents that show Canadian intelligence discovered Israel purchased 80-100 tons of yellowcake from Argentina during 1963-1964 for its nuclear weapons program. I made it as far as the section which started lionizing Clapper. Wasn’t he the one whose disingenuous congressional testimony ostensibly spurred Snowden into action? Seems like damage control on Clapper’s part. Is the implication that both Clapper’s memory and ethical sensitivity have somehow been jogged?